Brasília, Brazil – March 16th, 2018 – coffee&climate (c&c) is proud to announce another big step towards a more sustainable coffee production: The Community of Practice (CoP), a local platform powered by c&c brings together stakeholders from the entire coffee production and supply chain. CoP members meet every 4 months to share and discuss knowledge and experiences of successful climate smart agriculture techniques that reduce climate impacts on coffee production. In the last learning session that took place in December 2017 at the Instituto Federal Campus Machado in Minas Gerais, experiences on ‘good agricultural practices to adapt to climate change’ were systematized and shared. For example practices like cover crops between coffee rows, organic matter, organic-mineral fertilizer, shade trees, afforestation and varieties resistant to pests and diseases and tolerant to adverse conditions of low precipitation. One action point the members of the CoP agreed jointly on was to develop a declaration about theses ‘good agricultural practices to adapt to climate change’ and present it to the Ministry of Environment in Brasilia. 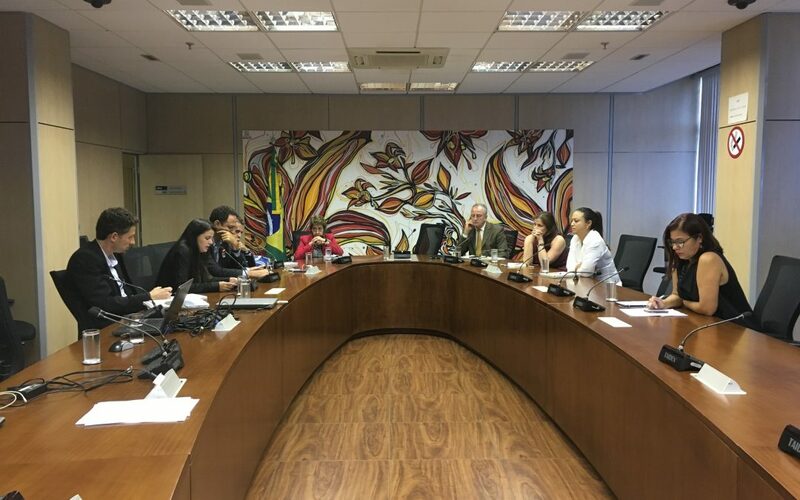 On March 12, a CoP delegation composed of Max Ochoa (Technical Director of Hanns R. Neumann Stiftung do Brasil), Fernanda Faria (c&c Coordinator), Pedro Ronca (GCP), Eduardo Sampaio (UTZ Certified) and Dr. Regis Venturim (EPAMIG) was welcomed by the Ministry of the Environment (MMA). The participating members of the MMA were the Secretary of Climate Change and Forestry, Mr. Everton Frask Lucero, the General Coordinator of Climate, Ms. Celina Xavier de Mendonça, International Affairs Advisor, Mr. Julio Cesar Baena and the Manager of Aquatic Biodiversity, Dr. Jaqueline Leal Madruga. In the meeting the declaration developed by the CoP members was shared and opportunities for public-private interaction to contribute to the implementation of national adaptation and mitigation objectives were identified. The CoP will meet again in April of 2018 to follow up on recent field know-how and to share further success stories on climate smart agriculture practices. The meeting will be held under the theme “Indicators of measurement of results and impacts of resilience”, where experiences will be shared and learnings about the theme will be built.